The American Dental Association recommends that brushes should be changed when the bristles are visibly frayed or approximately every three to four months. 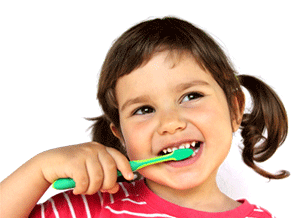 If your child is a toothbrush chewer, you might find that you need to replace their brush as frequently as once per month. Don’t worry if you have to change brushes frequently now. As your child grows older, the need for new brushes will decrease. Do not share toothbrushes. Germs can be easily spread on toothbrushes. Thoroughly rinse toothbrushes with tap water after brushing to remove any remaining toothpaste and debris. Debris left behind can reintroduced to your mouth the next time you brush. Yuck! Do not routinely cover toothbrushes or store them in closed containers. Enclosed containers create an environment where bacteria flourish. Replace toothbrushes at least every 3–4 months. More frequent changes are often needed for children. Read more about toothbrushes and research on whether they harbor microorganisms that can cause oral or systemic infections in the ADA Statement on Toothbrush Care.